A while back The Blogess posted a story about picking your battles and towels and whimsical chickens named Beyonce. It had me rolling for days. I immediately forwarded the link to all my closest female friends and then I went on a hunt for a chicken. One of my friends even proclaimed her allegiance to me and said, "I will help you carry your chicken". 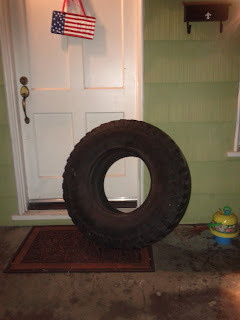 So in that vein I gifted a tire to my best buddy. You see, my buddy loves everything free - she is also my friend who helped me steal roses. 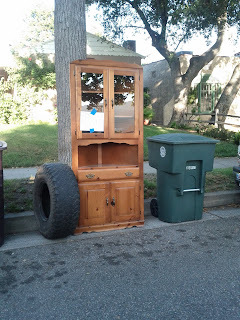 Caskey and I were driving down the street when we saw some free furniture. We told my friend about the furniture because she can't pass up a good deal and she was thrilled. Except her husband was out of town with the truck. My husband told her he should ask me to help anyway, so long as she didn't tell me he said it was okay. Her response was that she didn't have enough room but that the tire would make a great planter... just a bit of soil. Do you think the tire has as much whimsy as the chicken?